We didn’t plan at all to visit Vanuatu on this journey, but the wind brought us here. 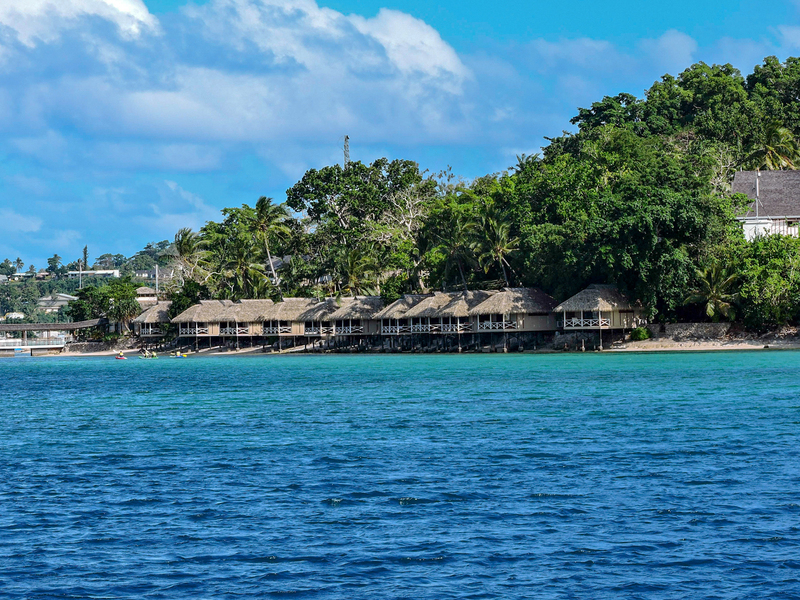 Being on Vanuatu we now have visited all the Melanesian countries, except New Caledonia, which is on the West and still belongs to the French. Melanesia consists of Papua New Guinea, Solomon Islands, Vanuatu, New Caledonia and Fiji. We don’t know anything about this country, but we have heard just positive things from tourists – that it is safe, clean, relatively developed (not as much as Fiji though), the political system is stable, the local culture and nature are well preserved, there are some really beautiful beaches, tourists (not too much) and many French speaking people. We arrive just in time for the big one-week-long celebrations of the country’s Independence Day. Port Vila is filled with life. It is Saturday, customs don’t work, and there is no way for us to check in. The immigration office is in vacation till next Tuesday. We are not allowed to leave the boat without our passports being stamped, but in the evening we decide to get on the shore to celebrate our arrival, well better said survival. We ignite the dinghy (the small inflatable boat) and leave to the shore in two batches. So here we are at “Bar number one” or “Numbawan” in the local language. We can’t believe we are walking on solid ground. We are elated and ecstatic, as we were after the first sailing. The colors, the sounds, the smell of everything, are so palpable. The energy of the land makes us euphoric. We jump and dance bare-footed in front of the baffled locals and tourists. The land is such an amazing thing! Walking is a little bit hard though and it seems we have “land sickness” which means we sway when we walk. Mr. Choi treats us to beer and French fries. Everyone is laughing this evening. Later, when we go back to our cabins, we can’t believe how stable and silent all is: the generators and the engines are sleeping their sweet dreams, there are no fierce waves crashing on your hatch and the bed is swaying a lightly, like a baby cradle. I feel all my exhaustion and muscle tension from the last days disappearing. But obviously the change is so big that I have nightmares all night. It is Sunday, the Independence Day of Vanuatu. We go on the shore illegally again. The streets of Port Vila are filled with colorfully dressed people wearing flags in their hair. They are dressed in traditional clothes, which makes women look like African maids from colonial times past. People don’t greet us in the streets and are more serious and less communicative than the Fijians. It seems like regarding these traits Vanuatu is something between the Solomon Islands and Fiji. There aren’t much landmarks, but the central part is nice to walk around. It has a beautiful coastal park with exotic trees and a view towards the bay filled with yachts. Good that our expenses are covered by the owner of the boat because prices here are mind-boggling, they are almost the same as in New Zealand. We start by passing along the museum, where we don’t enter (entrance fee 300 Vatu – 30 US Dollars) and finish at the Independence Park where it seems that all the population of Efate is. There are music bands, show programmes and a fair with traditional foods such as Lap-Lap (made of tapioca), lots of fish and chicken meat. Today Aska and Marchelo join us. They are part of the original crew who signed the contract with the owner of the boat. All the time they have waited us on Vanuatu living on the small yacht of Josi, a local ni-van (as people of Vanuatu are called). Aska is Japanese and Marchelo is Italian – they are one nice and colorful couple. The next day we clean and fix “Alabama” as crazy before we officially check on Tuesday. We are like a big family, the feeling is great. Our passports are stamped and we spend the whole week fixing things on the boat. As members of the EU we have 3 months visa free stay. The custom employees don’t even come to see what we bring on board. All goes smoothly. Men sit all day in the engine room trying to decipher the conundrums of where all the cables and pipes go. Women clean, do the laundry and do all kinds of choirs. Evenings are dedicated to songs, music and wild laughter. From time to time part of the crew goes to drink kava in the traditional kava bars called “nakamal”. The bars are dark and quiet places where men drink kava in coconut shells and expectorate their spit noisily on the floor. As we have already mentioned in previous posts kava is a drink popular in the Pacific, made of mashed roots of a plant from the botanic genus Piper. It has calming effect and only men drink it. It is an important part in all negotiations, gatherings and other social events in the region. Part of the crew will leave “Alabama” in the coming days. James and Carrie go back to New Zealand, as the fishing season starts. Sony, the Fijian, decids that the sea life is too hard for him and flies back to his family in Fiji. The Korean Choi also plans to go back to his business. So four leave but two new people come – Aska and Marchelo. Surprisingly another one joins us, the Argentinian Alejo who is part of the society of the alternative sailors. We work a lot and sometimes go out for walks. Our people know a lot of local people who they have met during previous sails in the region. Among them is a group of youngsters known all over Vanuatu for their impressive fire show. Some nights we go to watch the show. All the tourists and locals always stare at us when we go – a group of barefooted, hippie individuals wearing peculiar clothes. There’s a Korean family who learned we are involved in some Korean affairs and come to visit us bringing a lot of delicious food. We also find the Catholic cathedral of Port Vila, which turns out to be a simple wooden building. After spending a whole week in Port Vila we are given a “holiday” and both Mr. Shushtari and I put on our rucksacks and embark on a hitchhiking journey to explore Efate Island. After buying some vegetables that are really expensive here and we head out the city on foot. Hitchhiking is easy. Trucks and SUVs take us for short distances. Nature is amazing but sadly there is a barb wire on both sides of the road explicitly telling everyone this is private property. Most of the land belongs to foreigners who don’t want anyone to go on this beautiful meadows or enter the forests. We start hitchhiking in the late afternoon and soon it gets dark. It seems hard to find a place for camping as all is behind fences. Walking on the empty road we see a beautiful magical Pandanus forest and a white sand beach with unreal-looking rocks on it. A local family gathers wood on the beach. They say it is OK for us to camp here. Upon leaving they give us a bottle of water, sugar cane stems and oranges. In an hour the tent is pitched and the fire is set. There is no one around. Our heart are filled with tickling joy of touching the ground, the silence, the sound of the waves, the huge moon in the sky, glowing magically upon us… So much life in every stone, wave, bone and body! A local ni-van appears in the dusk. He says he is the owner of the land and assures us the places is safe to camp on. He is really caring and later brings us a plate with boiled cassava and fish. He says he will come back in the morning to have breakfast together. There are so many nice and amazing people living around every corner. Finally we are at home – at our tent. The morning is dedicated to bathing and resting on the heavenly secluded beach. Hitchhiking goes well again. A nice man, going around the island with his company car, takes us. We pass by Eton Village, famous for its blue lagoon, which has an entrance fee… Most of the landmarks and the best beaches on Efate have pretty high entrance fees. The east side of the island is covered in thick jungle. The island is not very populated. The villages are small and have the typical Melanesian houses built with materials taken from the jungle covered with tin roofs. We decide to enter the north-west side in order to make a full circle around the island, which is around 100 km., and go down after Ulei Village. Walking on the coastal alley there are no places to camp. Then we see a nice glade between two resorts but it is probably private property. Later some construction workers on the road surprisingly tell us to set our camp there. No one comes to bother us. At some point locals come to bring us tons of papaya fruits and lemons. The beach is amazing with a view towards a passage between Efate and a neighboring island. There are a lot of corals in the transparent water. In the evening we feel again a strong connection with the earth and the moon. We leave at noon as there is nothing urgent to do. Soon a truck takes us directly to Port Vila. The driver knows about our engine problems – news travel in a lightning speed here. We spend the afternoon in the park. There is no one on the boat. Then back to “Alabama” for another week of fixing things, sewing and cooking. This is the second week being anchored in Port Vila. There are so many things to be done. Days pass by and it feels as if nothing is accomplished. We want to leave as soon as possible in order to feel the sensation of traveling again. Finally we manage to tighten all the hatches, fix the hydraulic system and make two toilets and the water tap in the kitchen functional again. Anyway the main problems still stay as there are no engineers or spare parts in Vanuatu. In the mean time the Korean family who visited us feels closer. One day we even go to their home as I need to work on the blog and there’s no laptop on board. They invite me to rice with Korean kimchi and later even decide to join us for a week or two of sailing around Vanuatu. One evening, while walking in the outskirts, we see a base of the Marists, a Catholic congregation. We lived with monks and nuns from this congregation when we were on the Solomon Islands. We go to greet them. The main priest is really joyous. Besides him there are a priest from New Caledonia and a Frenchman. The nuns are respectively from France, Italy and Tonga. The mission is situated at an awesome place with a view towards the lagoon and has thick trees and gardens in the yard. The priest urges us to walk around, then calls us to attend the service for a recently deceased French missioner. The nuns and a group of local women sit on chairs in front of the “nakamal” (a building for gatherings) and pray in French. In the mean time several women cook food on fire in the nakamal . Soon men come bringing several bottles of kava with them. There is a small feast after the prayer. We chat with the main priest of the Marists who was born on Anatom Island. He tells us everything about past traditions and customs. Mr. Shushtari is invited to try Vanuatu kava for the first time and it turns out it is much stronger than the one on Fiji. Usually after a few coconut shells one cannot walk in a straight line, but he drinks five and is as steady as a rock. The main difference between the Vanuatu and Fiji kava is that they don’t dry the roots here and that is why it is supposed to be stronger. The ritual of drinking here is also more individual, not done together in a circle as on Fiji. After a few shells everyone goes to sleep. Drinking kava is an everyday thing for the men on Vanautu. It is the last day before sailing away so we buy tons of food from the French supermarket chain “Au bonne marche” and move the boat to the marina to refill our water tanks.